Lost Coast Adventure Tours provides shuttle and guide service for hikers in Northern California who are visiting the world famous Lost Coast trail along the Pacific Ocean. The trail is remote, hard to reach, and there’s no cell or other services along the 24.6-mile trail. When I first met Owner Blu Graham, he had no control over his website. The hosting account was owned by his previous developer. His potential customers couldn't get the answers they needed to buy without calling on the phone or sending an email. Customers would ‘reserve' a shuttle spot via phone and pay cash on arrival, meaning cash flow was spotty and no-shows resulted in lost revenue opportunities and empty shuttle seats. Their outdated website meant it was hard to gain traction over their much slicker competition, even though they had insider knowledge of the trail and preparation needed to safely complete the hike. Create an interactive site that helps customers prepare for their trip. Once I received the project application, the first conversation we had to have was about budget. Their budget was wildly out of line with the complexity and goals for their website. I let Blu know up front that, although I was sure I could help them, I couldn’t continue the conversation unless they were open to addressing their budget gap. What technical support they would need once the site was live. I knew from painful past experience that clients can sometimes be the biggest barrier to a successful project so I set firm boundaries and required Blu to meet several times with a professional copywriter who was able to take his expert knowledge of the trail and craft it into engaging website copy and a detailed FAQ page. We worked on the project for three months during the off-season and launched on time and on budget in time for the start of the 2017 hiking season. 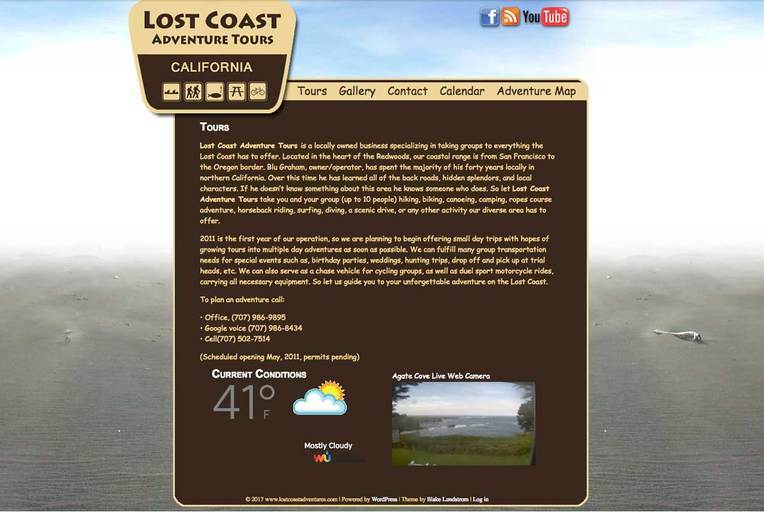 Now Lost Coast Adventure Tours has a modern website where customers can find out everything they need to know to safely plan their trip and then book a shuttle within minutes. Visitors can browse the photo gallery of the trail, and read the extensive FAQ to prepare for the trip. The Trip Planner and FAQ pages gave the site an SEO boost to be more easily found by silicon valley tech workers looking for an escape to nature. My phone has stopped ringing and that's a good thing. Most of the time, I'm out on the trail and don't have time to answer questions and play phone tag with customers. My staff manages the website and prints shuttle manifests for the drivers. We had to hire two new drivers and add two more shuttle times to keep up with demand. Our look to the public is like night and day. Overall, our customer service is way better. The benefits of the website were immediately felt by the team, but the company also benefited. Revenue more than doubled in the 2017 season compared to 2016. With this new foundation in place, the Lost Coast team is well positioned to keep streamlining their business for future growth and profits. The new site is awesome. I had to pull my drivers aside and say, “hey this is what we look like on the website, this is what we need to look like when people show up. It set an expectation for us – we look like a big business. I told Blu This is the best investment that we've made for this business because it's turn-key. We walk in [when the season starts] and turn the computer on and the business is already running. And that is invaluable to have. All we have to do is come in, get warmed up, and show up to shuttle people. We really appreciate that you guys are there to answer our questions and are quick to respond when we have questions about how to use the site. It's so much easier for me, I can just say, visit our website, it's self explanatory. 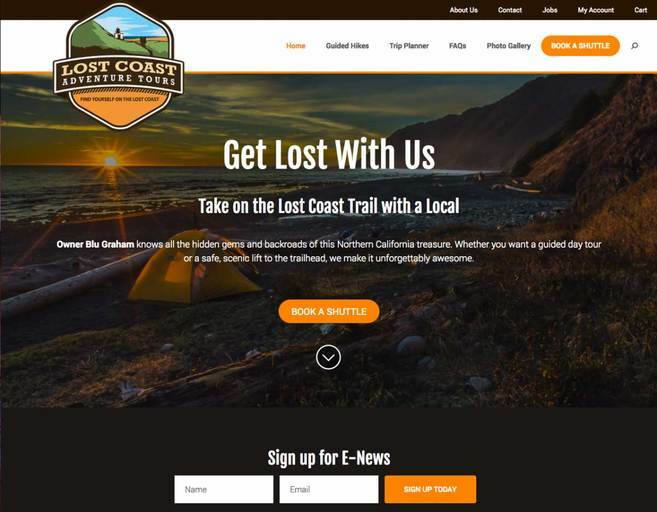 The Karvel Digital team continues to support Lost Coast with technical website support and maintenance to keep their new site working smoothly. In the 2018 season, we helped develop new functionality for booking their new guided hikes service, and we continue to offer marketing support such as managing their Active Campaign account and creating new automated follow-up campaigns. Ready to have your own online marketing growth engine? Apply to work with us here.